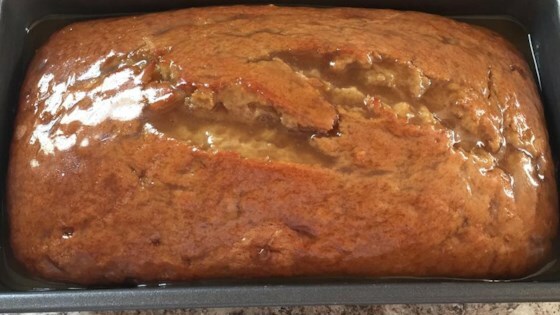 "This is a sweet-salty recipe for decadent banana bread with an unusual twist that is guaranteed to satisfy your sweet tooth. This bread is great served warm; toast in a toaster oven, if desired." Whisk flour, baking powder, and 1/2 teaspoon salt together in a bowl. Beat 1/2 cup butter and 1 cup brown sugar together in a bowl using an electric mixer until light and fluffy. Add eggs, 1 at a time, beating just until combined. Beat bananas and 1 tablespoon vanilla extract into butter mixture. Gradually add flour mixture, beating on low speed, just until incorporated. Pour batter into prepared pan. Bake in the preheated oven until a toothpick inserted into the center comes out clean, 45 to 55 minutes. Cool in the pan for 20 minutes. Run knife around edges of bread and transfer to a wire rack. Heat 1/4 cup brown sugar and 2 tablespoons butter in a saucepan over medium heat; bring to a boil. Cook, stirring constantly with a whisk, until sugar is dissolved, about 1 minute. Stir cream into brown sugar mixture and remove saucepan from heat. Stir 1/3 cup confectioners' sugar and 1/4 teaspoon salt into cream mixture until glaze is smooth. Drizzle glaze over loaf. Perfect! Excellent as a desert bread. Oh dear. Made this for breakfast the night prior and had to have it as a midnight snack. It tasted so good. Definitely a dessert bread or special breakfast. Probably make again. I was letting it cool for a few minutes before putting on the glaze, my other half noticed it cooling and helped herself to a slice!